Vincent Leonard Price Jr (May 27, 199 – October 25, 1993) was born in St. Louis, Missouri, the son of Marguerite Cobb (née Wilcox) and Vincent Leonard Price, Sr., who was the president of the National Candy Company. His grandfather, Vincent Clarence Price, invented Dr Price’s Baking Powder. Price attended St. Louis Country Day School. He was further educated at Yale in art history and fine art at the Courtauld Institute in London. Price became interested in the theatre during the 1930s, appearing professionally on stage for the first time in 1935. In 1936, he appeared as Prince Albert in the New York production of Laurence Housman‘s play Victoria Regina opposite Helen Hayes, which signaled the start of his long and varied career as an actor, lecturer and author. 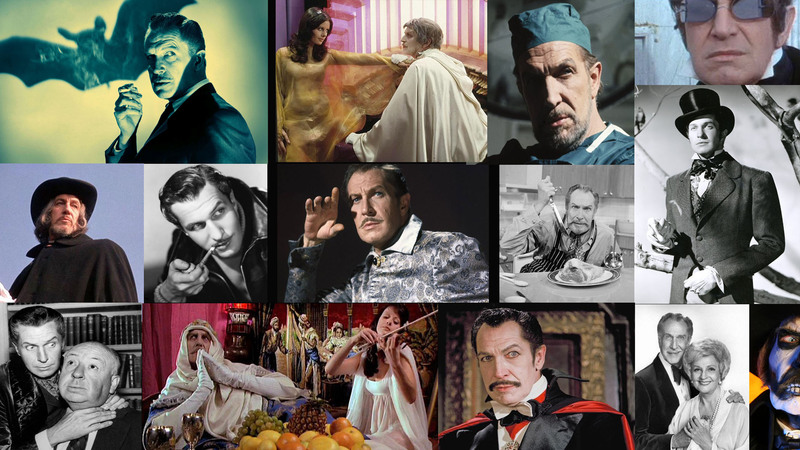 Best remembered as the master of horror and suspense for his work in classic films such as The Fly, Masque of the Red Death and Theatre of Blood, Price devoted nearly 60 years to entertaining young and old alike. Following a brief career on the stage, including a three-year run as Mr. Manningham in Angel Street, he made his film debut in the 1938 screwball comedy Service De Luxe, and appeared in a wide range of motion pictures, including Laura (1944), Dragonwyck (1946) and Champagne for Caesar (1950). He was also active in radio, portraying Simon Templar in The Saint that ran from 1943 to 1951. Price began his foray into villainous roles as a member of Orson Welles’ Mercury Theater and with films like House of Wax (1953). During his acting career, Price starred in more than 100 films, most significantly with Roger Corman’s Poe cycle of films for American International Pictures, in which his sinister image was personified. Price also found time to appear in some 2000 TV productions, including Batman (as Egghead), The Brady Bunch, The Hilarious House of Frightenstein and as the host of Mystery! (1981-1989). He continued his work on the stage, notably with Diversions and Delights, a one-person play about Oscar Wilde, which he staged around the world, and in radio with the BBC horror and mystery series The Price of Fear. In 1982, he sealed his iconic status by lending his voice to Michael Jackson’s Thriller and providing the narration for Tim Burton’s short, Vincent. In 1989, Price was inducted into the St. Louis Walk of Fame, and his last significant film work was as the inventor in Tim Burton‘s Edward Scissorhands (1990). A fine art historian and collector, Price served on the boards of various art organisations, gave lectures on primitive and modern art, and authored several books on the subject of art, including The Vincent Price Treasury of American Art. From 1962 to 1971, Price selected and commissioned some 50,000 pieces of fine art on behalf of Sears-Roebuck to be sold to the general public as part of the Vincent Price Collection of Fine Art. Price wrote his memoirs in I Like What I Know and Vincent Price: His Movies, His Plays, His Life, and was the author of The Book of Joe: About a Dog and His Man, as well as several cook books. In 1992 he was awarded the Los Angeles Film Critics Award for life achievement. Price was married three times, to actress Edith Barrett (who died 22 February 1977), costume designer Mary Grant Price (who died 2 March 2002) and to stage actress Coral Browne (from 24 October 1974 until her death from breast cancer on 29 May 1991). Price had two children Vincent Barrett Price (with Edith) and Victoria (with Mary). During the 1960s, Mary and Vincent donated hundreds of works of art to East Los Angeles College in order to endow the Vincent Price Art Museum there. It became the first teaching art collection owned by a community college in the United States and today contains over 9,000 pieces, all housed in a new Performing and Fine Arts Center that was opened in 2011. Price’s daughter, Victoria, still serves as a board member. Price suffered from emphysema and Parkinson’s disease; his symptoms were especially severe during the filming of Edward Scissorhands, making it necessary to cut his filming schedule short. His illness also contributed to his retirement from Mystery!. He died of lung cancer on October 25, 1993, at UCLA Medical Center at the age of 82. He was cremated and his ashes scattered off Point Dume in Malibu, California. In 1999, Victoria wrote a biography about her father for St. Martin’s Press. In late May 2011, an event was held in Price’s hometown in St Louis, Missouri to celebrate his 100th birthday. This Vincentennial included a public event with Victoria at the Missouri History Museum and a showcase of ephemeral and historic items at a gallery inside the Sheldon Concert Hall (a video of which is included below). A black box theatre at Price’s alma mater, Mary Institute and St. Louis Country Day School, has also been named after him.